Red Lion brand Red & Blue Cheer Elastic Fabric Head Bands are the Hottest NEW Fashion Hair Accessory for Girls and Women of all ages. Fun Cheer Print Head Bands are composed of a Colorful ribbon fabric with a soft velvet fabric interior lining and an elastic band in the back to help them stay in place. These Sport Fashion Headbands are great for all sports, and leisurely activities. Relaxed Dimensions: 7/8" Wide and 20" Around. 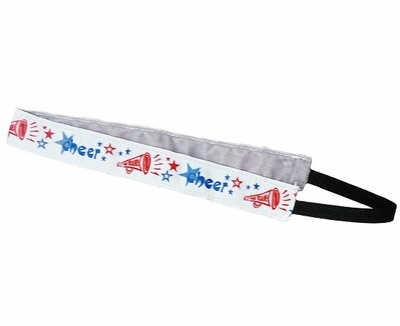 These Blue and Red Cheer Print Fabric Headbands are great for adding flare and style to your Cheer Teams, or any other Sports Team, while Working Out.